"For these reasons, along with the strong condemnation from the Argentine government of how statements like these harm Argentine society, the Jewish community, and all of humanity by trying to deny a historic truth, the national government has decided to demand that the Bishop leave the country or be expelled." In the interview with Swedish television, Williamson said, "I believe that the historical evidence is strongly against -- is hugely against -- 6 million Jews having been deliberately gassed in gas chambers as a deliberate policy of Adolf Hitler. "I believe there were no gas chambers," he stated. 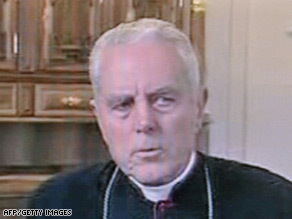 Williamson, who had already been removed from his seminary post in Argentina, made headlines in January when he and three other ultra-conservative bishops were welcomed back into the Roman Catholic Church, more than 20 years after Pope John Paul II excommunicated them on a theological question unrelated to the Holocaust. The rehabilitation of Williamson sparked condemnation from Israel, American Jewish leaders and German Chancellor Angela Merkel, among others. The Vatican pointed to several statements by Pope Benedict XVI condemning the destruction of European Jewry. The pope said he did not know of Williamson's views on the Holocaust when he lifted the excommunication. The Vatican said Williamson will not be allowed to perform priestly functions until he recants his Holocaust denial. Williamson apologized for "distress" his remarks caused the pope, but has not retracted them. Last week, a German court refused to intervene on behalf of Williamson, who is facing prosecution for denying the Holocaust -- a crime in Germany. CNN's Brian Byrnes in Buenos Aires contributed to this story.